Aerolíneas Argentinas, the flag carrier of Argentina, signed an agreement to join SkyTeam in 2012. Aerolíneas will be SkyTeam’s first South American member, adding 38 new destinations to the SkyTeam network. Leaving in the early evening from Amsterdam’s Schiphol airport on October 28th and arriving at the same place in the early dawn of October 31st, Dr. Kostas Iatrou - the co-founder and managing director of Air Transport News - had just completed the journey of a lifetime. Flying exclusively on SkyTeam carriers, Dr. Iatrou used a condensed version of the Round the World Pass offered by SkyTeam and its 13 member airlines. Aerolíneas Argentinas, the flag carrier of Argentina, will sign an agreement by the end of October to officially start the process of joining SkyTeam as the first South American member of the airline alliance. Customers will benefit from increased access to and from Latin America. 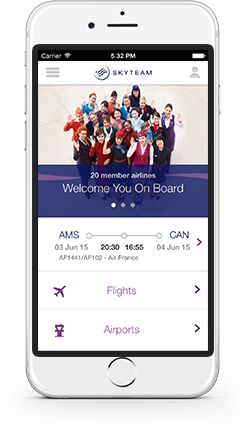 SkyTeam is a global airline alliance providing customers of member airlines access to an extensive global network with more destinations, more frequencies and more connectivity. Passengers can earn and redeem Frequent Flyer Miles throughout the SkyTeam network. The members are Aeroflot, Aeroméxico, Air France, Air Europa, Alitalia, China Southern, Czech Airlines, Delta Air Lines, Kenya Airlines, KLM Royal Dutch Airlines, Korean Air, TAROM Romanian Air Transport and Vietnam Airlines. Issued bi-monthly, the SkyTeam NewsFlash provides media with key updates and insights on alliance activities. The CEOs and Chairmen of SkyTeam today gathered in New York to celebrate the tenth anniversary of the alliance. Since its founding in 2000, SkyTeam has more than tripled its membership, doubled flights and nearly doubled destinations to offer customers easier connections across all continents. During a ceremony held in Hanoi today, Vietnam Airlines officially joined the SkyTeam global airline alliance. SkyTeam is increasing its focus on Asia as a whole, and by welcoming its first member in Southeast Asia, the alliance significantly strengthens its network reach in the region. Several developments in 2010 show SkyTeam's ever-expanding network in China. If there is a city that clearly represents the explosive momentum that China is experiencing, it is Shanghai. The EXPO 2010 SHANGHAI, held between 01 May and 31 October, is the city's largest event of the year and reaffirms Shanghai's position as a key international gateway to Asia in the 21st century. SkyTeam contributes to this boom by bringing people from all continents to this vibrant metropolis. The city is also the home of intended future SkyTeam member China Eastern Airlines, the official carrier for the Expo. China Eastern Airlines today announced its intention to join the SkyTeam Airline Alliance. During an official ceremony in Shanghai, China Eastern President and Chief Executive Officer Ma Xulun joined the CEOs of SkyTeam member airlines to sign a Memorandum of Understanding confirming China Eastern's plans to join the SkyTeam Alliance by mid-2011. With China Eastern as a partner, SkyTeam passengers will benefit from improved access to SkyTeam's extensive Chinese domestic network. For the second year, SkyTeam will be prominently present at the ITB Berlin. The ITB is the largest travel trade show in the world and attracts exhibitors, professionals, visitors and media from all sectors of the international travel and tourism industry. SkyTeam’s Managing Director, Marie-Joseph Malé, will be present at the SkyTeam stand at the ITB on Wednesday 10 March, where he will mark SkyTeam’s 10-year anniversary and elaborate on the alliance’s history and achievements of the past ten years as well as ambitions for the future. China Southern Airlines, (NYSE:ZNH) (HKSE: 1055) (SHA: 600029) - www.csair.com/global - the newest member of SkyTeam and the largest airline in The People's Republic of China, today announced its plan to join SkyTeam Cargo in 2010. The announcement was made by Mr. Luo Laijun, Senior Vice President Cargo, China Southern Airlines during the 4th IATA Cargo Symposium in Vancouver. For the second year, SkyTeam will be prominently present at the ITB Berlin. The ITB is the largest travel trade show in the world and attracts exhibitors, professionals, visitors and media from all sectors of the international travel and tourism industry. SkyTeam’s Managing Director, Marie-Joseph Malé, will be present at the SkyTeam stand at the ITB on Wednesday 10 March, where he will mark SkyTeam’s 10-year anniversary and elaborate on the alliance’s history and achievements of the past ten years as well as ambitions for the future. Furthermore, SkyTeam is a premium sponsor of the ITB Aviation Day on 12 March, where executives will address key issues in the global aviation industry. The members of SkyTeam respect the decision made by Japan Airlines to remain in the oneworld alliance. Delta Air Lines (NYSE: DAL) and SkyTeam today issued the following statement in response to the announcement that Japan Airlines (JAL) has entered into court-led financial restructuring under the guidance of the Enterprise Turnaround Initiative Corporation of Japan (ETIC).